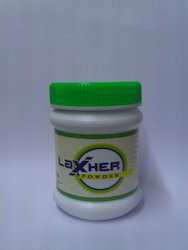 Leading Wholesale Trader of laxher powder and laxher digestive powder from Ahmedabad. · direct influence on intestinal epithelial cells. · senna increases the peristaltic movement of colon by irritating the mucosa. · senna contains chemical called “anthraquinones” which stimulate colon. · the powerful anthraquinone presence interacts with bectria in the digestive tract to create a chemical that provokes intestinal contractions. · anthranoids glycosides are not absorbed in the small intestine, instread they are mantained as prodrugs until theyreach the large intestine where they metabolised. mild laxative, an excellent anit-oxidant, best toxin remover and used as a digestive aid. gives relief from abdominal colic. is a mild herbal colon cleanser. it is said to aid indigestion and soften the bowel. anti spasmodic, carminative, stimulant tonic as well as anti flatulence. mild laxative, digestive aid and excellent anti flatulence.